The Heart Shri Shankara is a detailed study of what Shankara said about the reality of the world, and other views. 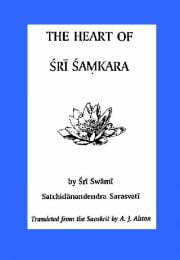 It was first published in 1929 under the title Refutation of Root Ignorance or The Heart of Shri Shankara. The text considers the philosophical view that there is a ‘root-ignorance’ that ‘creates’ the phenomenal world and which in some sense really exists. The Swami sets out to show that this view arose among scholars of advaita after Shri Shankara and is not entirely in line with his true teaching. The work is here made available in a comb-bound edition. It will be of interest to specialist students of technical advaita philosophy.